Actress Sophie Turner, who most of us became aware of with the meteoric rise of Game of Thrones popularity, has never shied away from controversy or speaking her mind regardless of potential blowback. She’s proven to be smart, well-spoken, and as sharp-witted as her character (probably more so). She’s spoken out on mental illness before, and the issue seems to be near and dear to her heart. Her latest Twitter lesson about why we should never joke about mental health is spot on, so let’s all go to school, shall we? 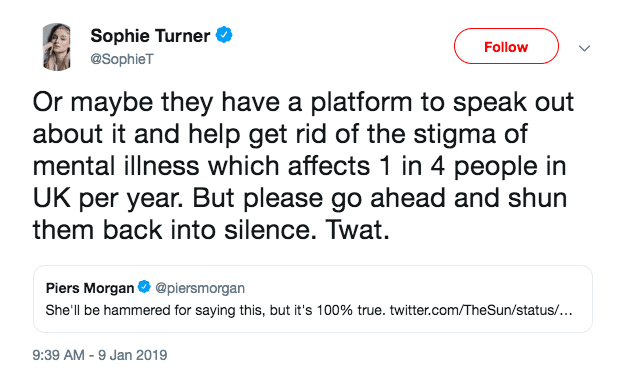 It all began when Piers Morgan spouted off about how he agrees that celebrities are trying to make mental illness “fashionable” and perhaps they’re not really suffering. 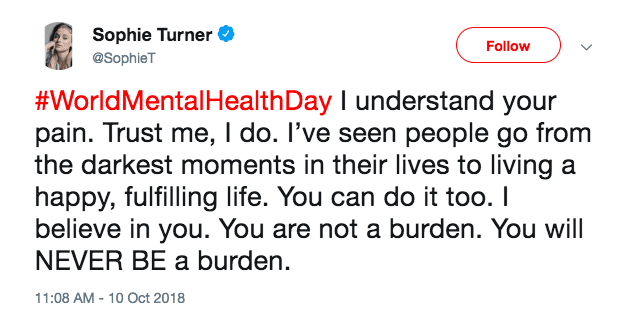 He was responding to an original comment from Beverley Callard, an English actress who talked about her own struggles with depression in an interview. The last sentence, in case you weren’t clear, is the bit Piers Morgan agreed with and many people, Turner included, couldn’t take sitting down. 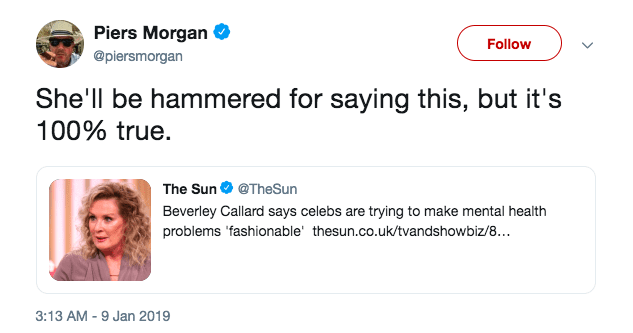 Personally, I’m not sure how Callard could say that we’re making headway when it comes to de-stigmatizing mental illness, then in the next breath say that celebrities were in danger of treating them like a new handbag. Actresses like Julia Louis Dreyfus spoke out about their breast cancer and treatment, yet no one would think of accusing her of trying to make cancer “fashionable.” So why should mental illness be any different? That said, every voice counts when it comes to fighting the battle against mental illness, so people should speak out, if they feel comfortable, whether they’re celebrities or not. Because the best way to change minds and hearts and, eventually, the healthcare system is to make every single person realize there is someone in their life who has struggled, is struggling, or will struggle with mental illness.